Justin Timberlake may have played Sean Parker in The Social Network, but he’s had a real-life social networking role to play as an investor as Myspace (sans intercapitalized S) showed off its new look yesterday. These are actually reasons to leave Facebook or to find an alternative—and right now, the MySpace reboot is looking way better. Facebook is little more to me than a glorified Digg now where I share some bookmarks, but not where I share my real statuses. And we all know what happened to Digg. It’s a slight exaggeration as some of my closer friends get some status updates, but the majority come via Twitter, and that’s plugged in to my Facebook. Twitter, too, no longer has the effectiveness it once had in itself, unless you are directly contacting someone. About the only newer (2007 and on) platform I get any pleasure out of is Tumblr, but that’s not what I call a social network. 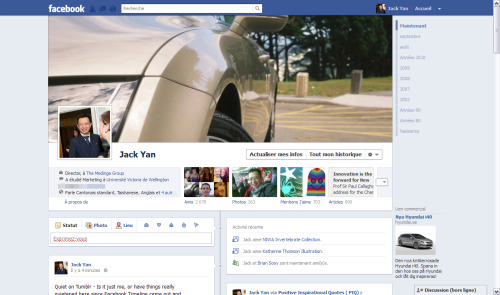 It’s funny, because one year ago, I was raving about Facebook Timeline. How Facebook gave me instant gratification through “likes” and how it looked so clever. But then, as with the Oldsmobile Toronado, designers tinkered with it. They added unnecessary features, such as the second friends’ box. Anything that was ingenious about the original Timeline, such as the way it could guess your most significant past moments, disappeared or was pushed down—or rendered useless. The fact that fan pages still don’t update on the 1st of each month—a bug that existed when Facebook first created Timeline—suggests to me that the company doesn’t really care any more about the user experience. It’s all about the money, and when that happens, the lovin’ feeling’s gone—just as it had with Google, which I also used to rave about. While the pundits are saying that Myspace is great because it focuses on music, they are missing the other angle. Based on the preview, it’s a visual delight. It makes updating your social network look good, and you have a fleeting moment of pride as you see the next status go live. We’re so spoiled with technology now that we like those experiences—and the new Myspace user interface, created by Australian firm Josephmark, captures that part of us. I can dig updating in News Gothic. Freed from the clutches of the Murdoch Press, Myspace might come good again—at the perfect time as Facebook fatigue—and even a bit of Twitter fatigue—sets in. I never thought I would say that. I just hope the new management keep the website clean: don’t do a Facebook. And I still have more friends on Myspace than I do on Google Plus, so I am starting from a bigger number than I did on Facebook all those years ago. I realize I’ve blogged less in general this year. Once upon a time, when I blogged less here, I was over at Vox (when it worked), writing personal, cathartic posts, sometimes directed at a limited audience. But now, and I never thought I would say this: Facebook seems to be where I’m directing some of my activity. The big attraction came on September 25, when I upgraded to Facebook Timeline. Since I’ve worked in visual communications for most of my life, Timeline’s look appeals to me, and, like others who favoured the revamp, I spent some time experimenting with it. Naturally, I also rechecked my privacy settings—a must whenever Facebook makes a change. And, I am sure Mr Zuckerberg will be happy to hear, I began sharing more. It’s that human trait of wanting instant gratiﬁcation from what you’ve shared. Vox was good for that: you regularly got feedback to the limited-audience posts from your closest “friends” (many of whom have become real-life friends). Facebook, which has, since I joined in 2007, allowed us to share different things to different audiences (I’m surprised when people think that this was a recent addition to the service) offers something similar, but till recently its user interface did not appeal to me. Tumblr was one of the few places that was more graphically driven, but there’s such a culture of reblogging there, and I never felt too comfortable sharing anything more than a few original photos and some pithy thoughts. Facebook became the service between writing long blog posts (here) and pithy reblogs on Tumblr. I could share photos with select audience members. If I had queries, I could direct them to one of the circles of people that Facebook, this year, encouraged everyone to set up (my ﬁve haven’t changed since Facebook allowed us to set up groups of friends beyond ‘Limited Proﬁle’). And the feeling of instant gratiﬁcation was there for things you wanted people to know about—that strange human need of knowing that you were heard. I wound up putting some things on Facebook that I would have put on Tumblr a year ago, even if it was to a closed platform, and even if it was to a limited audience. It was “my” limited audience, after all, a group which I knew would appreciate the content. It wasn’t that personally knowing the audience seemed to compensate for the cowardice of not putting something out there publicly—it was the knowledge that it would be seen, and “liked”. We humans need so little to get a kick. I know there’s Google Plus, but it’s just not for me. That has been covered elsewhere, but the smaller contact number there has no appeal. Of the 50-odd who have added me to their circles, I have a few real friends, all of whom I can reach more easily through email. This seems to be a round-about way for me to advise people that you can catch me on Facebook. For non-friends, I have opened up my account to subscribers, and occasionally write public status updates, or share public photos and links. I’ve also taken the backward step of setting up a fan page, where I record some of my business and political thoughts which are a bit more in depth than the minutiæ of life that form Facebook status updates. Then, there is Twitter, which I found myself using a lot less of since everyone went to ‘New Twitter’. New Twitter means an extra click for everything, and it’s far slower and buggier. Only this week have I switched to Twitter Mobile, even for my desktop and laptop, just so I can make a quicker judgement about whether to follow back a follower, and Tweet more reliably without an ‘Oops! We did something wrong’ message. I’m not so bold as to proclaim that Facebook is “it”, given the criticisms I’ve levelled at it in the past. I still have concerns over its privacy, just as I have concerns over Google about its terrible record. But, credit where it is due, whomever was responsible for Timeline seems to have understood the needs of some of its users. I know it’s annoyed some people—I have heard of one Facebooker who has used his account less since Timeline, because it turns him off—but, for me, it seems to be one of the better thought-out changes in the nearly half-decade I have been on the service, and fattened their wallets with my private information. I might have to go on to one of those Twitter clients, when “new” Twitter is forced upon all users soon. When it eventually began working (it didn’t initially), I liked the new Twitter’s overall look. It was only missing one feature: telling us what the last Tweet of the person was at a glance. I didn’t want to click on each person to see what their last Tweet was. The new Twitter is a little slower because it loads so much more—yet I don’t get any more utility from it, based on my usage. We all adapt, just as we did with wholesale changes to Facebook and other services. But I wonder whether it will be like Digg or Technorati, or, for that matter, Infoseek and Altavista (remember the portal gag? I think Google does), where changes scared people away.